If I could rate it 6 stars, I would. I know some people didn't like it or was disappointed with Warner being amazing and all...or for the writing but I think it was a fabulous final instalment for a YA and I loved it. Anyway, I still can't believe this is the end. I'm kind of shocked knowing that I won't be reading more of this series even if I desperatly want to. Now I'll just have to hide and mope about that for a week and remember how this story made me feel. Warner and Juliette (alias 'J') are just perfect for each other, especially in this book when she finally discovers who she really is. She doesn't want to cower and stay behind while the world is fighting anymore. She wants to fight, she wants revenge and she wants to lead them into battle. Somehow, Warner always knew it would come to this eventually. The chemistry between them was just too hot to handle and thank god, she finally aknowledged it. I can't get them out of my head because their relationship is so intense and sweet at the same time. Kenji was an amazing character as always, funny but also sensitive and that's a part of him we didn't really see before. About Adam I kind of feel bad for him but then he turned out to be someone I didn't recognize and while I knew he had his reasons, I couldn't find myself loving him like I do Aaron especially when he was acting like a total jerk toward Juliette. 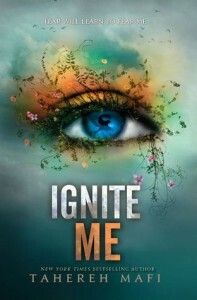 There is so much more to say about Ignite Me, but I'll let you find out by yourself because there is no words for it and I know I'll re-read it someday. If you havn't read this series yet, do it now and give it a try because you'll most likely end up loving it and wanting more.